CHOOSE HEALTHY TREATS FOR YOUR HALLOWEEN PARTIES: Are you throwing a Halloween party? You don’t need to stick to miniature chocolate bars and bags of candy. There are a lot of healthier – and more interesting – treats that you could be serving instead! Why not try making your treats instead of buying candy? This way you’ll be able to control the ingredients and you’ll always know what’s in everything you’re serving. This is especially important if you’re trying to cut down on calories, sugar and salt. However, it’s also very helpful for any guests who have dietary restrictions, such as food allergies or food intolerances. Since you’ll always know what’s in your food, you’ll always be able to tell people! You can also try healthy substitutions. Instead of candy, serve fruit. Use dark chocolate instead of milk chocolate. With a little bit of creativity, you can put on a healthy celebration that everyone will enjoy! GIVE HEALTHY ITEMS TO TRICK OR TREATERS: When it comes to handing out treats at the door, don’t think that you need to stick to chips and candy. There are a lot of fun things that you can give out without piling on the sweets. The items you hand out don’t even need to be edible! Instead of candy, try handing out Stickers, Temporary Tattoos, Pencil Toppers, Crayons, Small Toys (such as rubber balls, yoyos, etc. ), Decorative Erasers, Bubbles or anything else you can think of! If you want to give out edible treats, consider Pretzels, Granola Bars, Raisins, Prepackaged Trail Mix or Sugar-Free Gum. LIMIT HOW MUCH CANDY YOUR KIDS KEEP: Of course, there’s nothing wrong with having a bit of candy. However, as most parents know, the average kid comes home with way too much. No matter how much they want to, your child probably shouldn’t eat three giant shopping bags of candy. Have your children pick out their favourites and make a plan to ration them. Let your child eat only a couple of treats each day. This will prevent them from stuffing themselves with junk and then skipping a healthy dinner. As for what to do with the extra candy, you could give it away. Some places, such as many dentist offices, offer “candy exchanges” where you can turn in your candy for prizes, healthy treats or even money. Or, you could reuse it yourself. Package up the leftover candy into gift bags that you can use as favours for your next party. Halloween is a great time of year and with a little restraint and some creativity, it can be both happy and healthy. 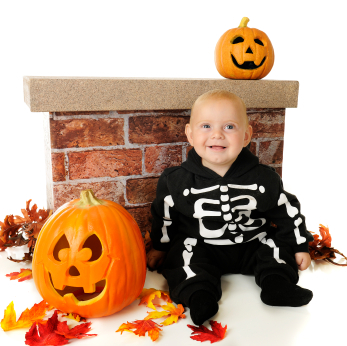 From all of us at Physiomed, we wish you and yours a happy, healthy and thoroughly enjoyable Halloween!